God is teaching me again the beauty of taking every thought captive. Far too long I’ve had the tendency to analyze, wonder, and try to figure out when I hear something or see something and “go there” in my mind. However, I’ve found I don’t have to ponder every story, person’s situation or hardship, or news report. I don’t have to let my mind wander about my stuff or anyone else’s stuff. The concerns of this world, of our families and friends, of our own lives, can and should be taken to God. He’s the One with all the answers, the solutions, peace, comfort, hope and healing needed. Thinking about something and praying about something are very different. I can think all day about problems, but when I pray about problems, then I’ve found the power from God to solve every problem. So I’m going to declutter the clutter of my mind by stopping any train of thought that leads to useless worry and fretting. Unless a thought brings me closer to God and His word, unless it uplifts, encourages, brings hope and light, I don’t have to let it mess with my head and mess in my head. If the thought isn’t a Godly thought, I can stop it in its tracks and throw it out. Following after worthless thoughts lead to worthless thinking. Perfect peace comes through keeping the mind focused on The One Who is perfect peace. Instead of trying to figure out on my own, leaning on my own understanding, and thinking about every thought that comes my way, I need to take every thought to God. Godly wisdom comes from above, so I need to keep my thoughts trained on The One who is above. When a thought comes, I’m checking which track that thought will lead. 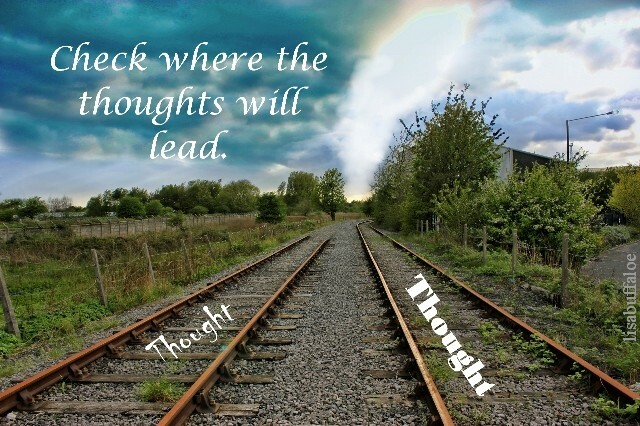 Will the thought track me to God or track me away from God? Let’s keep our thoughts on the right track by tracking them by God’s truth.